Chef showcases beef by cooking up dishes packed in protein and nutrients. The national beef checkoff, through its Northeast Beef Promotion Initiative and in partnership with the South Dakota Beef Industry Council, grilled up Roseda all-beef hot dogs and MVP burger samples for hungry participants at the 24th Annual Giant National Capital Barbecue Battle held June 25-26 in Washington, D.C.
As an official product sponsor of the two-day event, the beef checkoff invited folks to visit the beef booth for recipes, games, giveaways and more information about the versatility of beef and flavor profile that makes it a summertime favorite. During two-day festival, the beef checkoff's executive chef Dave Zino hosted two cooking demos per day in the Giant Sampling Pavilion. Zino cooked up Greek and Korean “Bowls with Balance” to showcase beef in a variety of ethnic dishes that are packed with protein and nutrients and are low in fat. The beef demos also included three Farmer’s Market Fresh relishes and salsas to accompany the perfect steak. For the second daily demo, chef Zino quickly whipped up a tomato relish, corn relish and pineapple salsa — using fresh ingredients available to consumers all summer long — for a unique twist on the traditional grilled steak. Thousands of festival-goers visited the checkoff booth on Pennsylvania Ave. for beef recipes, cooking tips and contests. The checkoff partnered with Roseda Beef of Monkton, Md., to offer nearly 8,000 samples of all-beef hot dogs and MVP beef burgers. 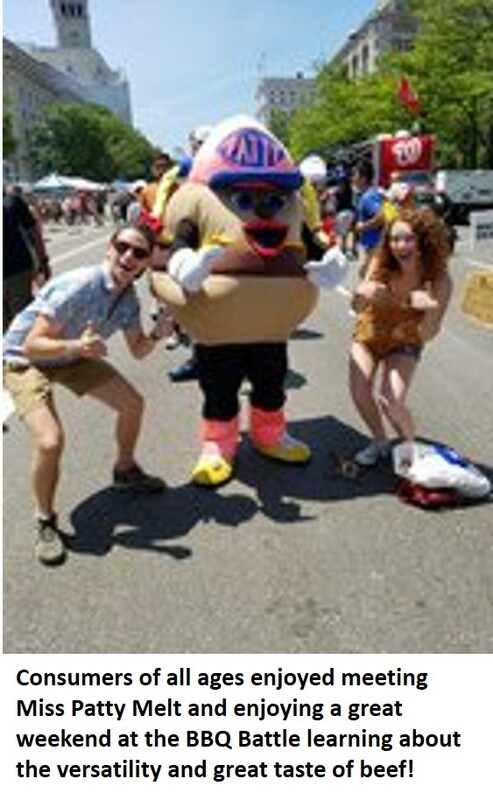 To help celebrate the weekend’s festivities, the checkoff's "Miss Patty Melt" mascot took a stroll down Pennsylvania Ave. greeting and entertaining BBQ Battle attendees. Patty Melt quickly became a crowd favorite as beef-eaters young and old stopped to snap a photo with her. In the weeks leading up to the festival, the checkoff hosted a "Let’s Get Grilling" online contest challenging consumers to test their beef knowledge and enter to win weekly beef swag prizes and tickets to the festival. In total, the contest garnered nearly 68,000 impressions and more than 4,000 engagements with Millennial consumers in the surrounding Washington, D.C., area.